When I first wrote the article about squatting at work, a lot of people were offended and a lot of people found it funny. Those who were offended were the ones who just spent 2000 dollars on a standing desk and brushed it off. Those who found it funny maybe tried the squat and failed or succeeded, but couldn’t hold it for long. Today I want to share with you the reason why you need to rotate between different desks and how it can help with your productivity. We all have a human body, so we are all movers. Don’t mistake the fact that you’re working in an office, would make you less of a mover. You evolved to be like this. 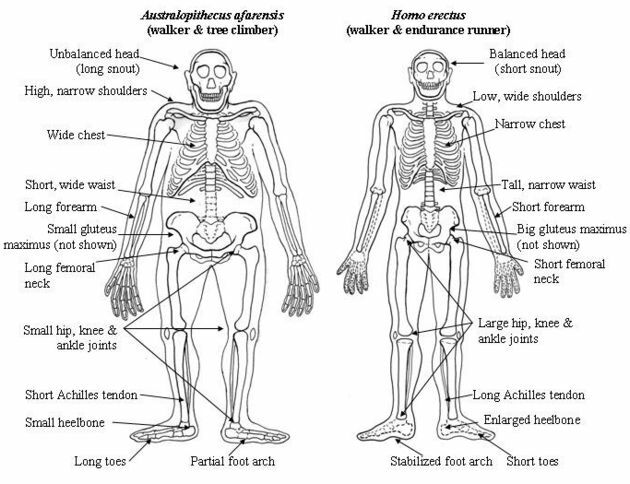 Millions of years ago when our bodies were shaped, we regularly walked and ran multiple miles per day. Every day. It wasn’t to train for a marathon, but to survive. We used to be hunters and gatherers. It was the only way to find food or to catch food. According to Daniel Lieberman, a Harvard Professor on Evolutionary Biology, from our hips to our feet everything is perfectly created to move. That’s probably also the reason why moving makes us feel good (you always feel good after a workout, because of the dopamine) and comes naturally to us once we’ve established the habit. The thing is, your body adapts to the things you do or don’t do. So if you’re sitting for 8 hours every day and then come home just to sit in front of the TV for another 2 hours, your body will get used to that. In itself that isn’t a problem of course. You can survive life perfectly fine without moving. At first. See a non-moving body tends to creep up on you and hits you when you least expect it: When you want to tie your shoes or when you want to lift your kid. Or even the neck pain you have in the office, can be a consequence of this. I don’t know about you, but I’d prefer to stay pain-free my whole life, versus running around and feeling pain all over my body. That’s the reason why you need to do some maintenance on your body, to make sure that the machine keeps on running. Aubrey Grey, Gerontologist who does research on aging and anti-aging often gives the example of a car, which you maintain and you can run it for 100 years without a problem, by constantly fixing the issues. But if you don’t change the oil or take care of the tires, the car will die way earlier on you. I get that you don’t want to be a professional athlete or want to run around all day. Afterall, there is still a lot of work to do in the office! I’m here to suggest something different, a very simple first step in the right direction. I call it desk rotation. If you’re reading this, chances are that you either work in an office or atleast in an office environment (working from home or a coffee shop). My suggestion here would be to simply switch between desks if you can or get creative. What does this mean specifically? and repeat this cycle for 2 times. The times in the above protocol aren’t set in stone, nor specifically designed for you, but it is meant to give you a pointer in the right direction. What if you don’t have a standing desk or can’t squat? Then you need to be creative. If your boss doesn’t allow you to work in a standing position (or doesn’t organize some standing desk to rotate), talk to him/her about the importance of rotating desks. It doesn’t only help your body to move, it also makes you more productive and more creative. Switching work places has been shown to increase creativity (Source; granted the desk was also messy, but that will happen anyway! ), so why not use this fact as an argument? If it’s financially not possible, because you’re a startup or can’t afford it for another reason, think about other creative solutions: Buy a LACK from IKEA for just 7.95 USD or get a staple of big books and put your laptop on there. 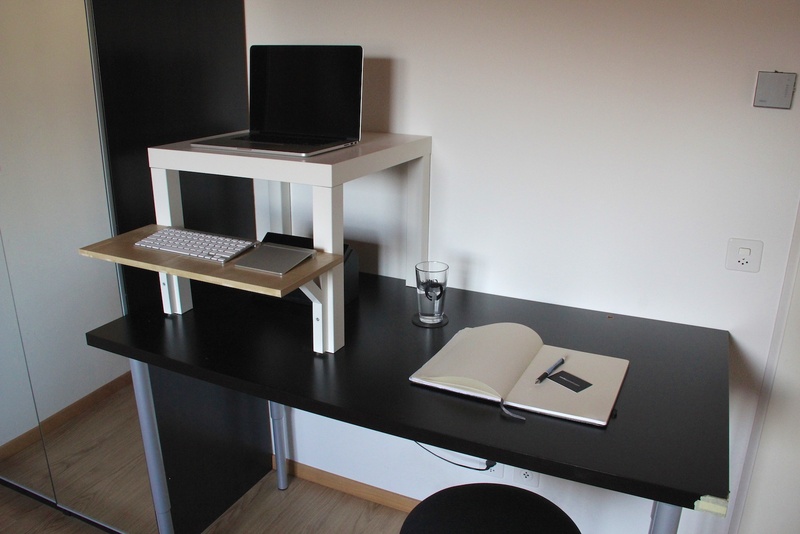 The LACK desk can serve two purposes: It can work as a desk on a desk, to change your normal desk to a standing desk, or it can work as your go to squatting desk, since it’s the perfect height for most people. If you can’t squat, we have a different problem. Your body forgot a basic resting position and we need to ease into it. A teacher of mine, Ido Portal, started the squat challenge where he urges people all over to accumulate 30min. of squatting for 30 days. That means if you have a phone call, talk in a squat, if you’re waiting for the bus, wait in a squat, etc. This will make squatting easier over time so that you can easily squat down for 5-10min. and handle a few emails. When I’m not posing for squatting photos, I work in a squat. As you can see our bodies were made to move and rotating desks is a perfect way in an office environment to introduce more movement. The protocol I’ve shown you above is just an example and can be adjusted as needed, but if you work in an office environment, it can be worth a try. I understand that some people might be put off by this, but if you can just organize a small group of a few people who are willing to try this out, you’ll realize how beneficial a little additional movement can be throughout the day.